Water Stored in Check Dam. Check dams generally require less operation and maintance compared to surface irrigation projects. Check dams are low weirs without canals off-taking, but they provide facility for lift irrigation and for lifting from wells recharged in the surrounding area. Check dams are therefore the most effective tool for water conservation at minimum investment and minimum maintanance and operational cost. They acts as ground water recharge means and they offer facility of lift irrigation in the surroundings. About 7 wells in the surrounding are racharged by each checkdam. 10 ha. 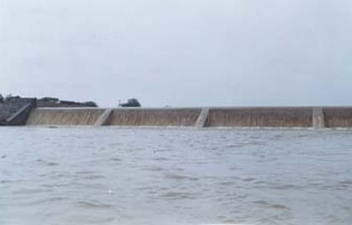 of land is benefited by each check dam. Check dams do not require land acquistion and hence most of the legal complications are avoided in the whole process. Morever the advantages are made available to the beneficiaries instantly, because of low cost of checkdams, poor farmers can also paticpate.